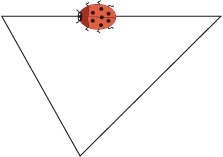 This ladybird is taking a walk round a triangle. She starts off near the middle of one side of the triangle. Can you see how much she has turned when she gets back to where she started? Would it be the same amount of turn if she went around another triangle? Angle properties of polygons. Visualising. Triangles. Generalising. Making and proving conjectures. Practical Activity. Interactivities. Investigations. Mathematical reasoning & proof. Working systematically.